Thiru. K.Rajamani I.A.S. DistrictCollector and District Magistrate, is an officer of Indian Administrative Service belongs to 2009 batch. 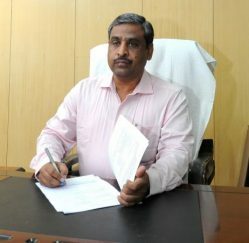 He had initially served in the State Civil Service (SCS) as Divisional Development Officer and then as Project Director in District Rural Development Agency( DRDA) in many Districts before got the IAS conferred and got the conferment into the Indian Administrative Service in June 2016 and was allocated 2009 IAS batch with retrospective effect. Subsequently served as a Commissioner and Special Officer, Thoothukudi City Corportation, Collector for Tiruchirappalli District before assuming charge as District Collector / District Magistrate in Coimbatore District.